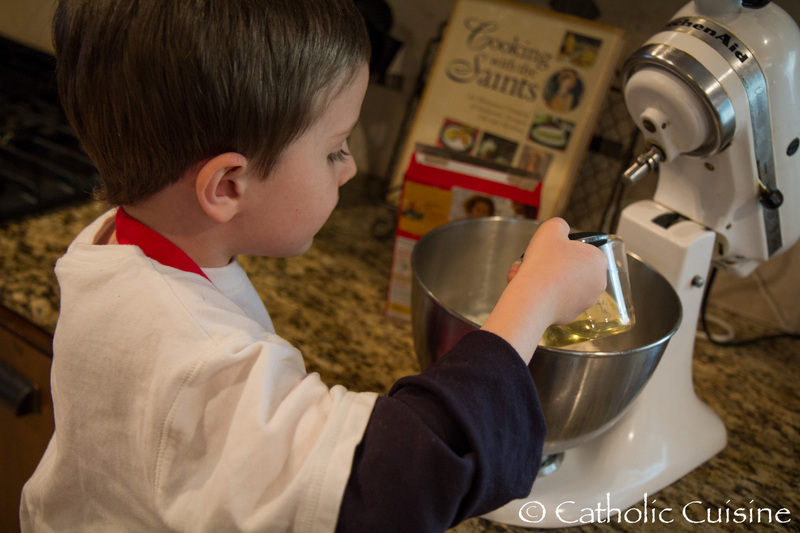 Mix the flour, baking powder and salt together in a mixing bowl. 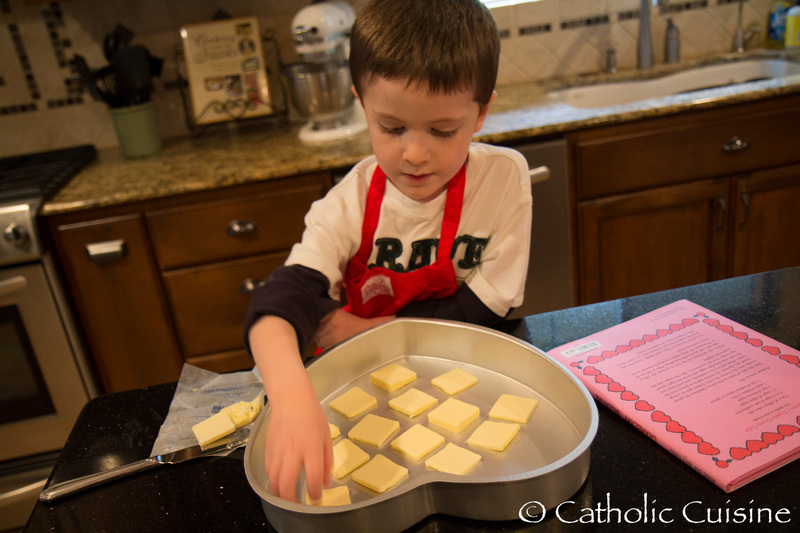 Rub or cut the butter into the flour mixture until it forms crumbs. Add the sugar, raisins and egg. Mix to combine into a ball using a splash of the milk if you need to get it to hold together. Roll out dough until it's about 1/4 inch thick. Cut into 3-4 inch rounds. Use extra butter to grease a heavy griddle. Heat griddle to medium heat and cook cakes 2-3 minutes per side. Turn only once. They should be a caramel brown, like pancakes, when cooked, although, some people prefer them almost burnt. Remove from pan and dust while still warm with the extra caster sugar. Enjoy! *Caster sugar is regular white sugar that has been processed to a finer texture. If you don't have any, just take a clean food processor or clean coffee grinder and process some regular white sugar until fine but not powdery. If you don't have any way to make your own, you can use powdered sugar but it's a different texture and usually includes some cornstarch. I used a coffee grinder for mine and in the picture below you can see that the homemade caster sugar is lighter and fluffier. ** I read in other recipes that you could add some "mixed spice" for a more authentic flavor. British "mixed spice" is basically pumpkin pie spice but since I don't use pumpkin pie spice, I added my own blend of spices. 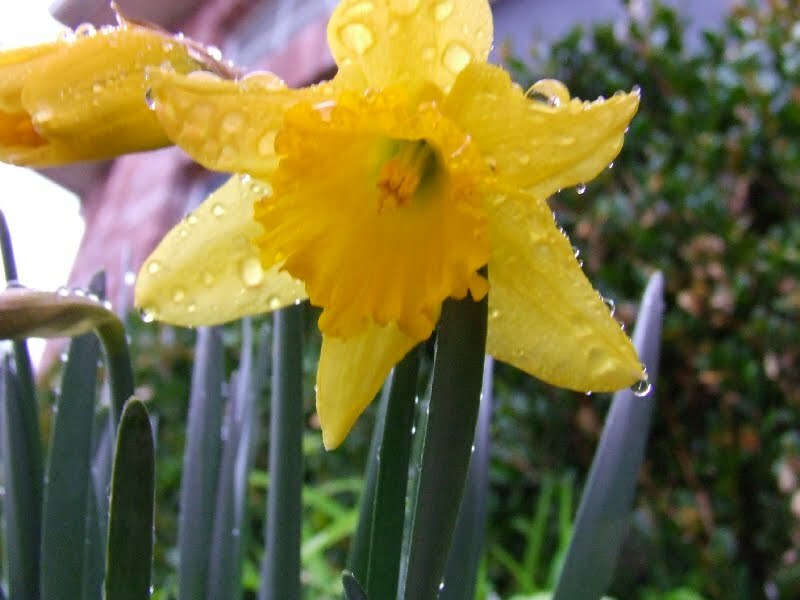 The feast of St. David is coming up on March 1st. In honor of the Welsh tradition of wearing leeks and husband's family's Welsh heritage, it's become our tradition to celebrate with leeks for dinner. shredded cheese to top, opt. Cook leeks in butter and oil until tender, stirring frequently, about 15 minutes. Stir cornstarch into broth and pour broth into pot. Add the potatoes and chicken and bring to a boil. Pour in the cream, reduce heat and simmer at least 30 minutes, until potatoes are tender. Mash potatoes for a chunkier soup or blend with an immersion blender for a smoother consistency. Season with salt and pepper before serving. Serve with shredded cheese on top. Preheat oven to 450 degrees. Toss the squash cubes in the oil. Place on cookie sheet in single layer. Sprinkle with salt. Roast in hot oven for 25- 30 minutes. They won't be crispy like regular croutons but they will be incredibly flavorful. God our Father, you gave the bishop David to the Welsh Church to uphold the faith and to be an example of Christian perfection. In this changing world may he help us to hold fast to the values which bring eternal life. Slice the stick of butter in thin pieces. Distribute the pieces evenly over the bottom of a 9-13-inch pan or a large round one. 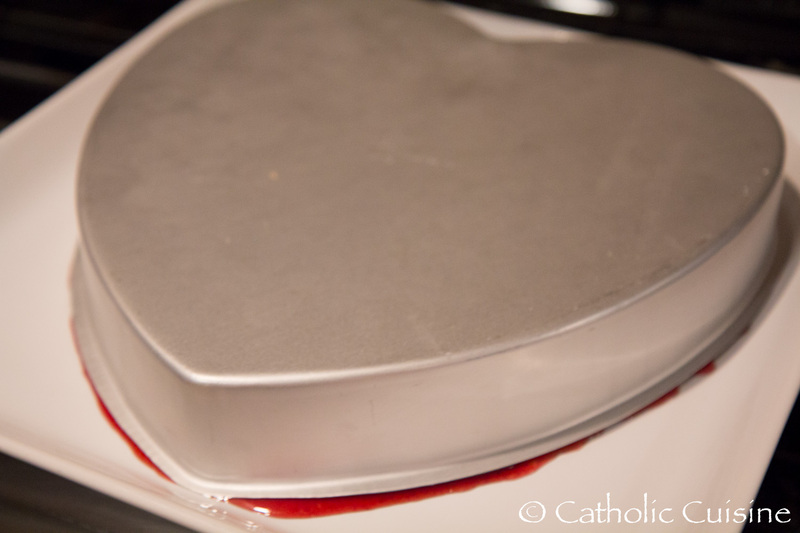 (We used a 12 inch heart pan - affiliate link) Sprinkle the walnut halves or pieces over the butter. 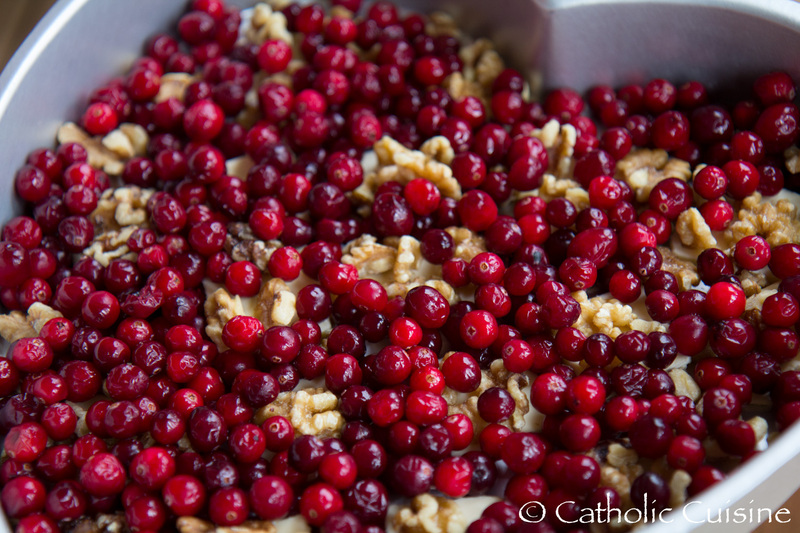 Wash and dry the cranberries, and pour them over the nuts. 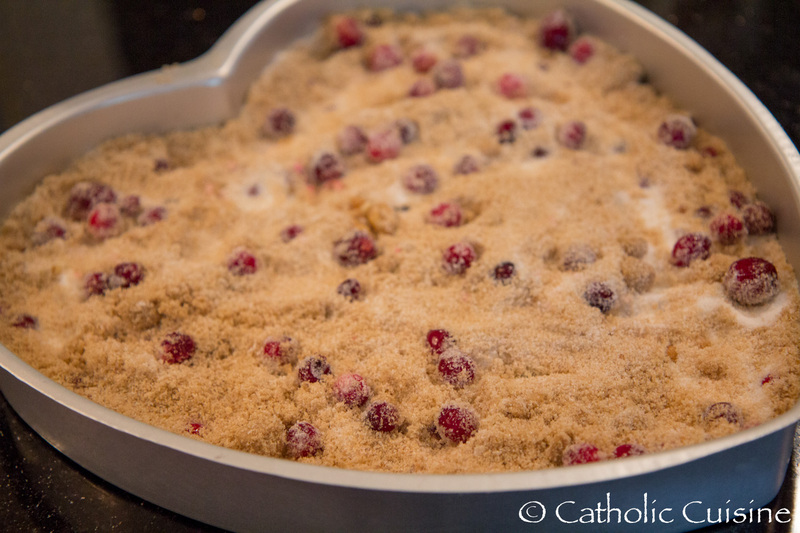 Add the white sugar and the brown sugar, spreading evenly over the cranberries. 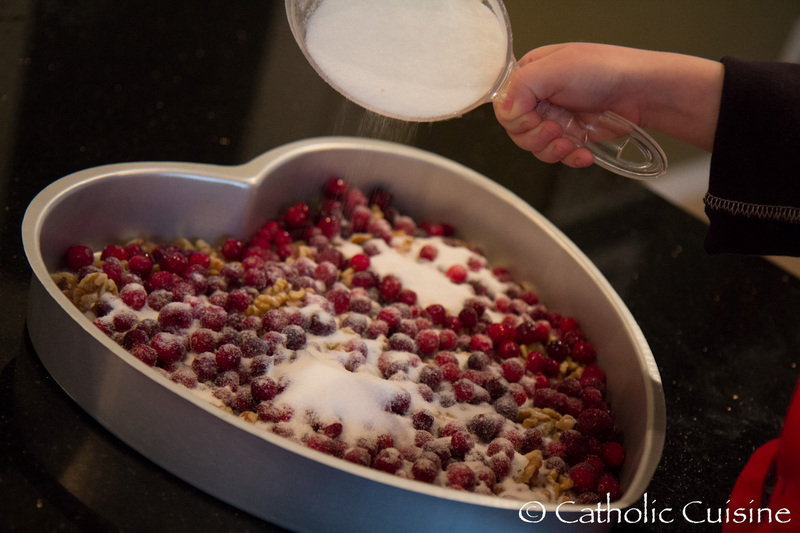 Mix the sugar and the cranberries slightly. 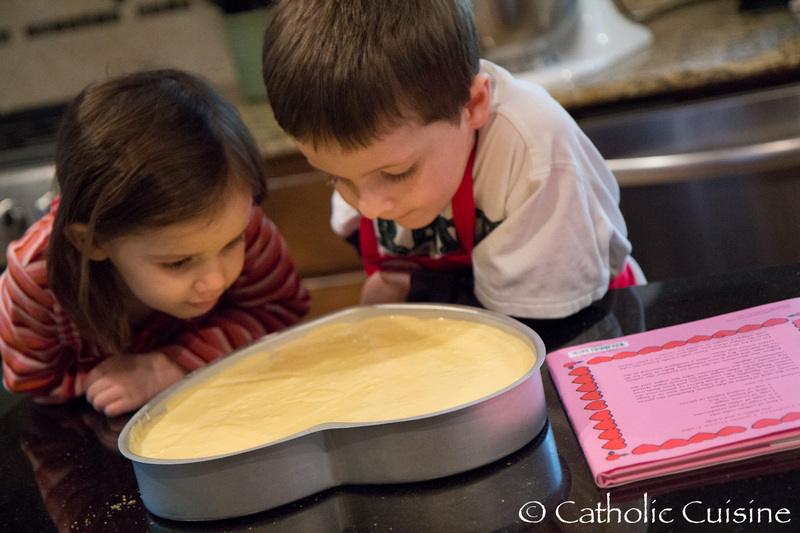 Follow the directions on the box to prepare the yellow cake mix, and pour it over everything. Bake at 350˚ for 40 to 50 minutes. It is done when a toothpick inserted in the center comes out clean. Let cool for 10 minutes. 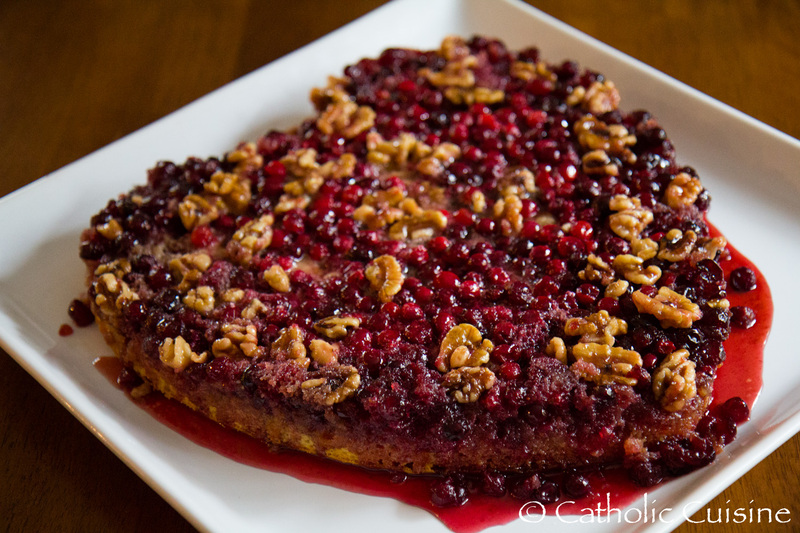 Then, with a knife, loosen the cake from the edges of the pan, and turn over on a plate. 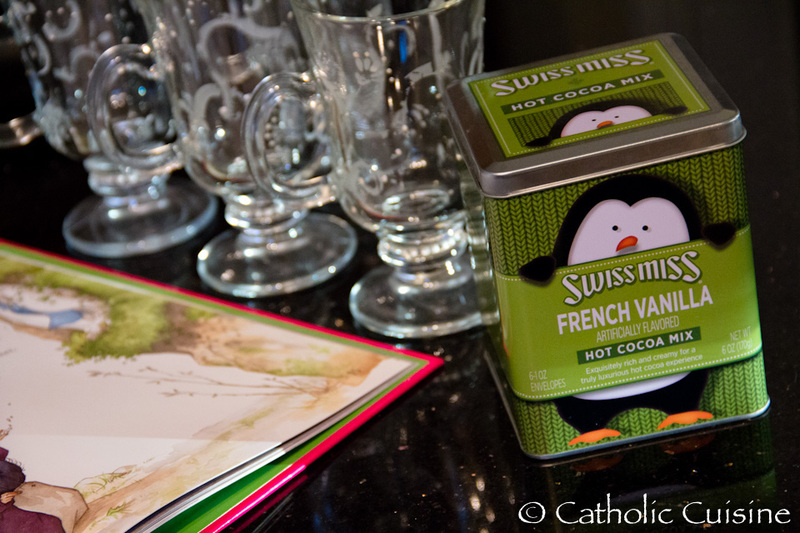 Serve with whipped cream or vanilla ice cream. 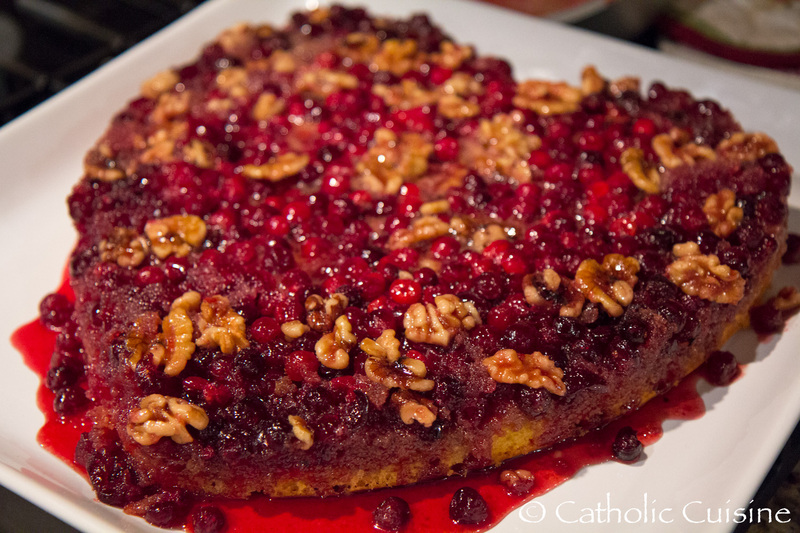 The following recipe was submitted by Jen, from Enter Under My Roof, for the upcoming feast of St. Valentine. Thank you Jen! Normally, when I think of St. Valentine's Day, I get an instant stomach ache at the thought of all the sugar that comes along with it (even if it isn't edible). 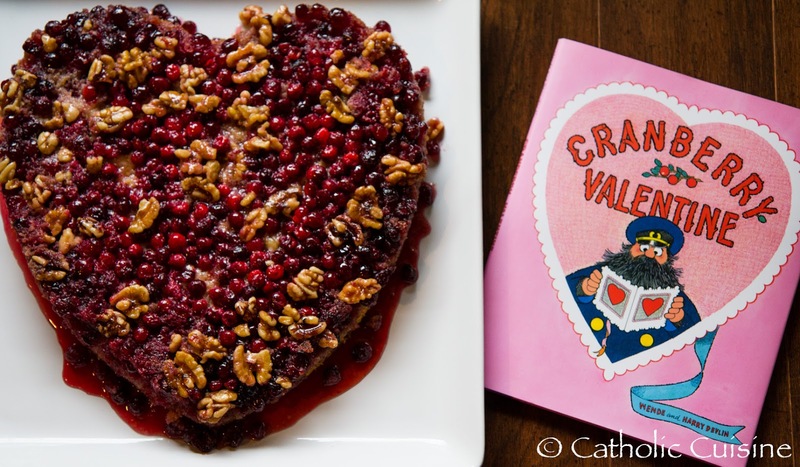 Luckily, I have an amazing mama friend who brought these adorable healthy tomato heart snacks to a St. Valentine's Day party last year and I've literally been waiting an entire year to break this recipe out! I'm sure this idea is all over Pinterest, but I'll always thank Kristi for bringing these into my life. 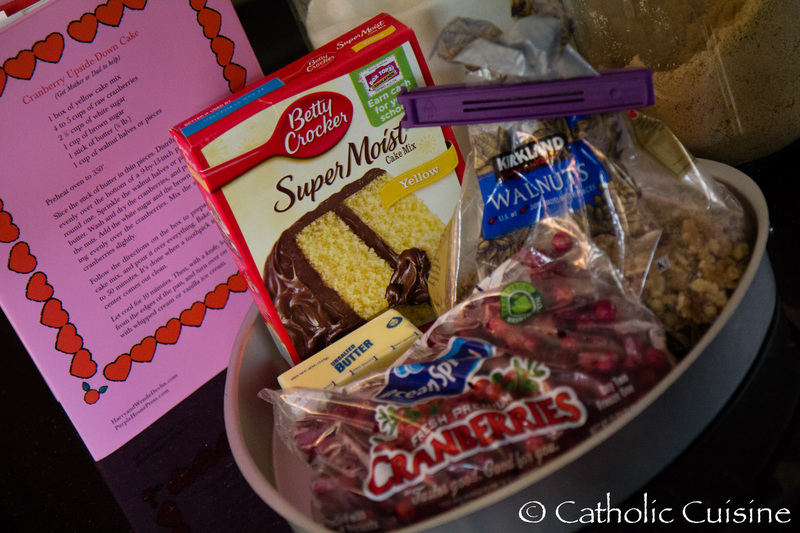 This healthy recipe definitely plays up more into the commercial side of St. Valentine's Day (hearts galore) but I promise, there is a spiritual aspect to these as well. By the time you're 3/4 of the way done making them, you'll be praying for patience. Trust me (wink-wink). While a bit tedious, I really did enjoy making these. Little man was happily playing with dad in the other room, and I relished in the quiet time (get it? tomatoes? relish? ...wait, are there even tomatoes IN relish??). All in all, it took me about :30min to make a dozen of the heart tomatoes, but that's from start to finish and includes the time to gather the supplies, learn my way through a few mistakes, and clean up. Select 24 tomatoes, picking them out in pairs. Make sure each pair of tomatoes is about the same size/shape. The more oval shaped, the better. Slice the corner off the tomato as show in Figure 1 above. I found it helpful to close one eye and visualize half a heart on the side of the knife. You'll look weird if anyone walks into the kitchen while you're doing this, but it'll get you the shape you need. A tip: save your tomato graveyard of leftover corner pieces - you can throw it in the freezer and toss it into your next pasta sauce. Yum! Repeat the above step 23 more times. Are we having fun yet or what? Remember to keep your tomatoes in pairs. Romantic, no? Using a toothpick, spear the two tomato halves together as shown in Figure 2 above. I thought it looked cutest if you put the toothpick through on an angle, but get creative and do what you like best. Using a label, or other paper with a sticky back, cut out a double triangle and two long thin strips as shown in Figure 3 above. Stick them onto the toothpick. You'll actually stick the paper onto itself by folding it in half over the toothpick. This holds it in place. Repeat the above step 23 more times. Pray for patience. 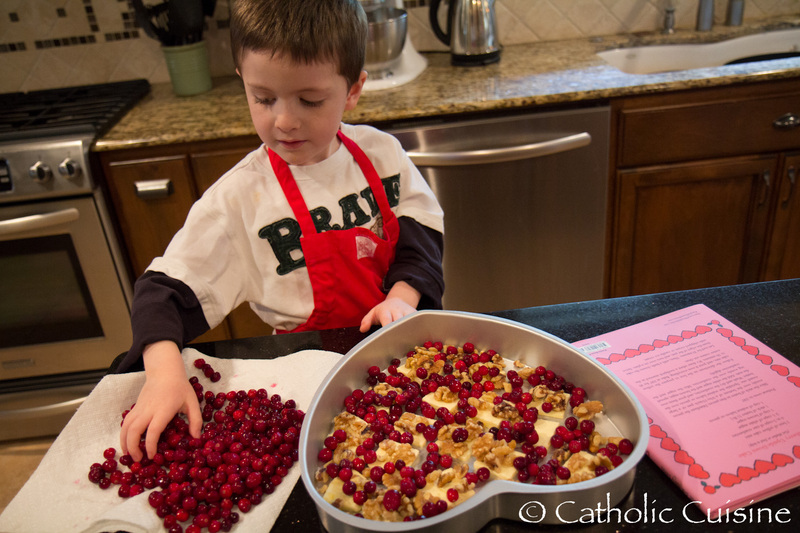 Be thankful you have the time and ability to make cute snacks for your loved ones. Remember what inspired you to do this in the first place. Voila! You're done. I left mine in the fridge overnight in an egg plate and they held up just fine. 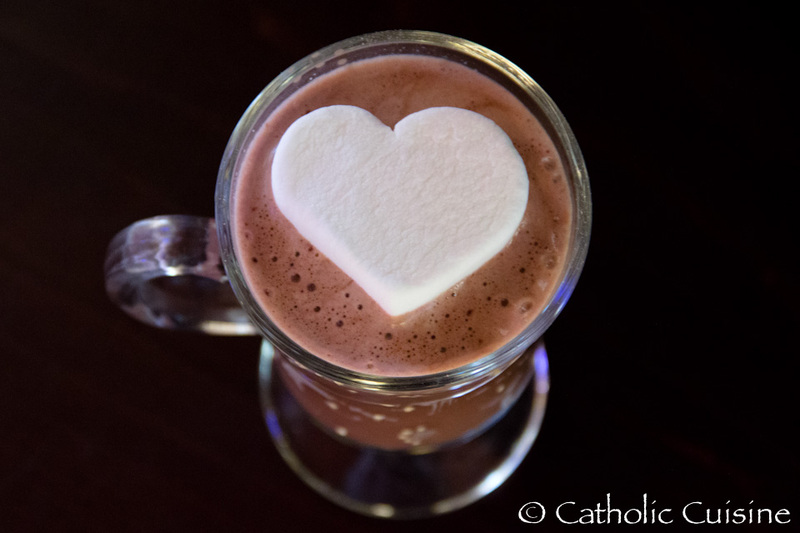 With Valentines's Day in just a few days, heart shaped marshmallows are easy to find this time of year. 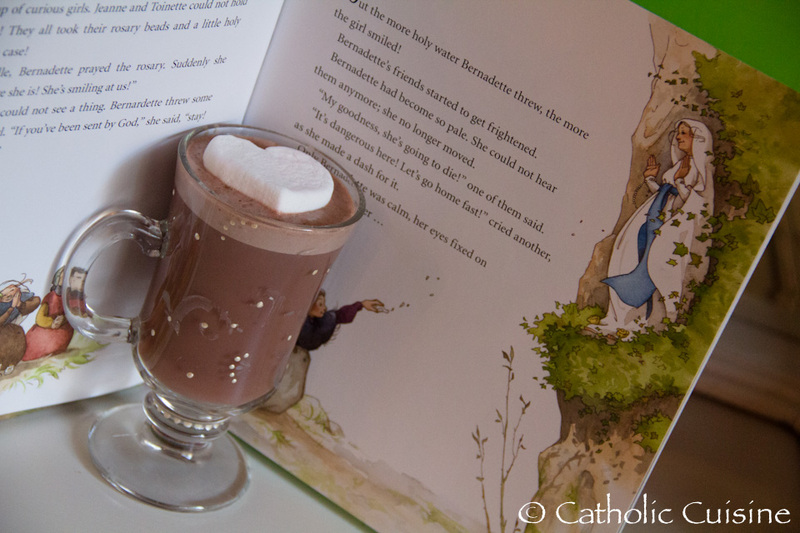 In honor of the feast of Our Lady of Lourdes consider serving French Vanilla Hot Cocoa topped with a white a marshmallow representing the Immaculate Heart of Mary! of St. Bernadette on February 18th! 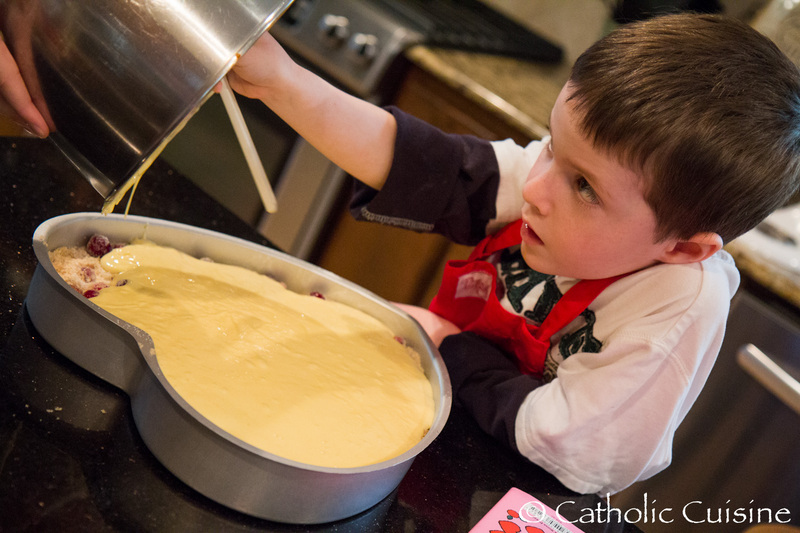 In Europe there is a tradition of giving blessed bread to others on the feast of St. Blaise, bishop and martyr. 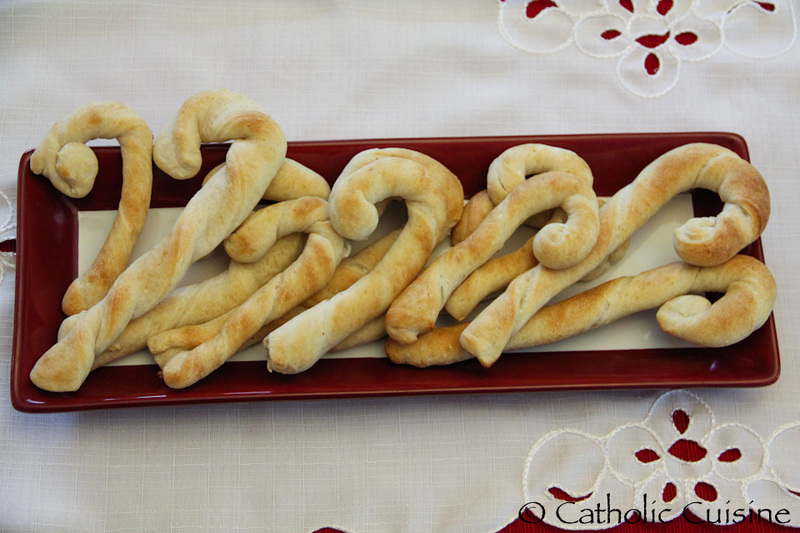 These are shaped into breadsticks called St. Blaise Sticks or Pan bendito. It is said that those who partake of the bread will be protected against problems with their throats. In honor of his memorial (February 3) consider serving breadsticks alongside a fish dinner, recalling the legend of St. Blaise saving the young boy from choking on a fish bone. Breadsticks can be made with either packaged breadstick or pizza dough, or using your favorite dough recipe. 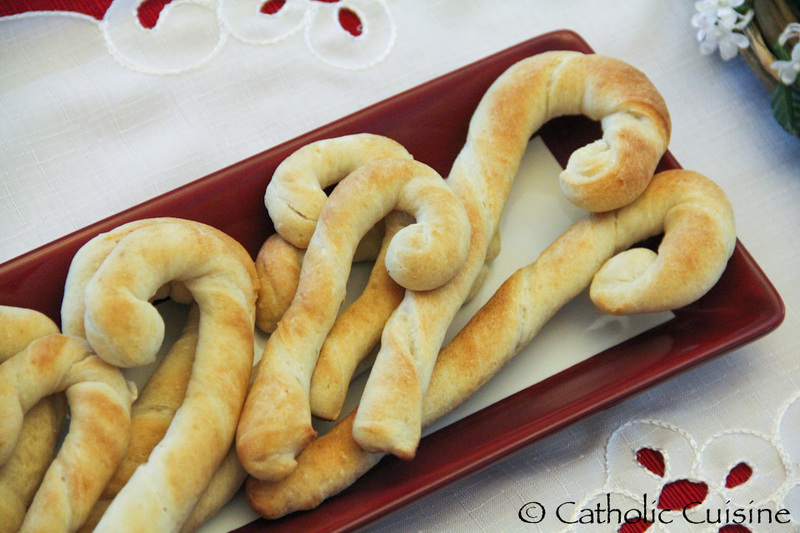 You can also easily shape them into a bishop’s staff before baking for a fun and symbolic twist!